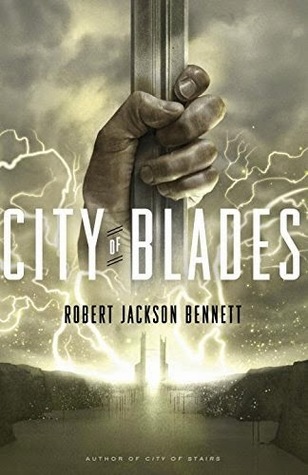 „City of Blades“ is the second novel in Robert Jackson Bennetts „The Divine Cities“ series and even though it’s the sequel to „City of Stairs“ and in several ways linked to the events that happened in the first book it actually tells a story on it’s own that in my opinion would also work as a standalone. Compared to the prequel two major things have changed, one of them being the location: While „City of Stairs“ was set in the city of Bulikov, the former political and cultural capital of Bennetts fantasy universe, „City of Blades“ takes you to the city of Voortyashtan which is even less glamorous than what the Battle of Bulikov left of the scene of the first book. Like most of the cities in this world, Voortyashtan was once ruled by a powerful Divinity, the goddess of War and Death Voortya. But when the Saypuri folk fought their way out of slavery, defeated the armies of the Continent and destroyed the Divinities, Voortyashtan just like every Continent city lost all of its glory and is now another unstable wasteland that always seems to be on the edge of another bloody conflict between the Saypuri and the Continent. When you’re confronted with Robert Jackson Bennett’s universe for the very first time, the very complex setting might appear a bit confusing and overwhelming but in its core it’s really not that difficult to understand: there are two rivaling peoples, the Saypuri and the Continent of which the former are now in charge after a long time of being oppressed by the Continent. Everything else is mostly background information including all the stuff about the Divinities that once ruled the world but are now dead which also means that all their Divine artifacts no longer work and have lost their „magic“. But some of those relics of the Divine still remain a mystery, just like the new element that has been found in Voortyashtan which is the starting point of „City of Blades“: Is this just a lucky discovery that could usher in a new era or is the mysterious ore a remnant of the Divinities which could mean that the Gods are still alive somewhere? As you all know (because I’m not getting tired of mentioning it^^) I’m not such an avid fantasy reader but the world Robert Jackson Bennett has created is actually one that I can’t get enough of because it’s so unique and complex and mysterious and I just LOVE it. One the one hand it seems so ancient with all these old relics, ruins of what where once impressive buildings and witnesses of a glorious era and discovering these places often made me feel like an historian that gets to explore an old world full of mysteries but on the other hand there are also some modern things like cars and telephones and all these things combined make for an extremely fascinating setting that is one of the most interesting and exciting I’ve ever encountered in a book. Another thing I really like about the Divine Cities series is that these books are basically crime novels (yay!) set in an extraordinary fantastical world. While the core of „City of Stairs“ was the murder of a Saypurian professor in the city of Bulikov we now have to investigate the disappearance of an employee of the Ministry of Foreign Affairs who was supposed to research the new (and maybe Divine) material in Voortyashtan and since the Ministry wants to keep the new ore a secret until it has been further researched it’s actually some kind of secret undercover mission which I found really exciting. I’m not sure if every fantasy fan is as intrigued by this as I am because even though there are some epic battle scenes the story is mostly rather slow but for me as a reader who loves mysteries above all the combination of crime novel and fantasy was just perfect because I got an interesting criminal investigation with an exciting mystery to solve but all this in a unique world that „normal“ crime novels usually don’t provide. The second big change compared to „City of Stairs“ is the new main character – yes, there’s a „new“ one since in contrast to the first book we no longer follow former ambassador Shara Tivani/Komayd (who is now Prime Minister) but the new protagonist is no stranger either. If you’ve now hoped for the violent Dreyling Sigrud to be the star in this sequel then I’m sorry for having to disappoint you but Shara’s actual successor is just as awesome: it’s General Turyin Mulaghesh and even though I have to admit that I barely remembered her from the prequel I can definitely say that Bennett couldn’t have made a better choice – well, maybe except Sigrud… I already liked the author’s choice because it’s quite unusual that a middle-aged, one-armed and female (!) war hero is the protagonist of a story but Mulaghesh totally won me over with her first appearance in this book where she „welcomes“ some idiots who dared to disturb her in her exile by stepping uninvitedly onto her property by shooting them with her bow – shoot first, ask questions later. I definitely need more foul-mouthed, strong and courageous characters like Turyin Mulaghesh and the best thing is that Bennett didn’t just make her an entertaining protagonist that blatantly insults stupid people and (literally) single-handedly fights her way through enemy lines but also provided her with a lot of depth by showing his readers the dark and insecure side of her that results from all the cruelty and pain her years in the army have put her through. So overall „City of Blades“ is a really great sequel that comes with a fresh premise due to the new Voortyashtan setting and the new protagonist but still provides all the things that made me already fell in love with „City of Stairs“: Robert Jackson Bennett’s fantasy universe is still as fascinating and unique as in the first book and so complex and original that I can hardly imagine ever getting tired of it. Even after two books there still seem to be so many secrets to unravel, so many Divine things to discover and so much history to explore that I hope that the Divine Cities series will indeed be a very long one. The worldbuilding is so interesting that I would even read a prequel series that takes place in a world where the old Divinities are still alive because there’s just so much potential for lots of great stories. 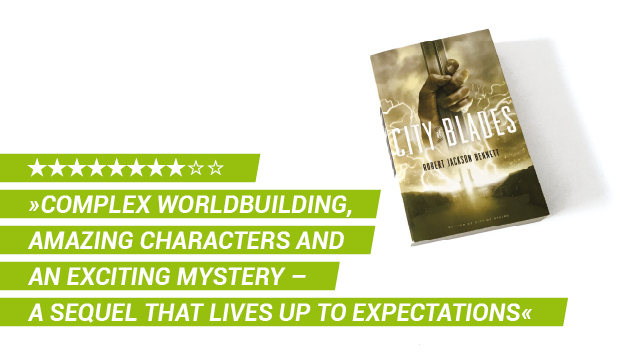 There were a few moments where I found the story to be a little bit dragging and I would’ve also loved to read more about Sigrud but nonetheless „City of Blades“ totally lived up to my expectations. So if you’re looking for a fantasy series with a very unique und fascinating setting and an amazing female protagonist that definitely doesn’t fit into the norm then this book is one that you shouldn’t miss – and it even isn’t necessary to have read „City of Stairs“ though the book is of course even more fun if you actually did. Robert Jackson Bennett's "City of Blades“ is a great sequel that comes with some interesting changes compared to the first book like the new setting and the new protagonist but still provides all the things that made „City of Stairs“ already so unique: the complex and original worldbuilding, amazing characters and an exciting mystery that almost feels like a classical crime novel just with an extraordinary setting. I really wouldn’t mind if more mysteries took place in a fantasy setting. It works so well in this world! I could also definitely read a lot more books in this series, and I like your idea of a prequel series. I’m really sad that „City of Miracles“ apparently is going to be the last book in this series but I kinda hope that the author sticks to the universe somehow. Did you already see that the next book has Sigrud as the main character? How awesome is that? I guess no one can take credit for recommending you this series, haha.